Middelfart is a marine protected area containing a high density of harbour porpoises. Seiche is working in partnership with Aarhus University and Naturpark Lillebaelt to provide real-time monitoring of porpoise activity and levels of ambient sound. The aim of the Listening Station is to help gain an understanding of why this area is important for porpoises, why porpoise activity fluctuates over 24-hour periods as well as throughout the year, and how human activities affect porpoise behaviour. 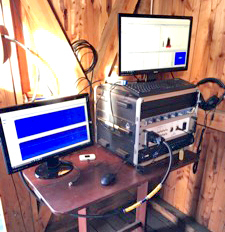 Software is used to remotely access and control the system over the internet, and audio and visual displays are streamed to the Seiche YouTube channel. Viewers may see a spectrogram of ambient sounds, a map with the tracks of larger vessels (AIS reports), or a click detector display, where porpoise clicks are automatically displayed as red triangles. The audio is a mix of low frequency background sounds and high frequency porpoise clicks that have been dropped down into human hearing range output via a PAMGuard envelope detector. An audio cable transmits these sounds to an adjacent public display.